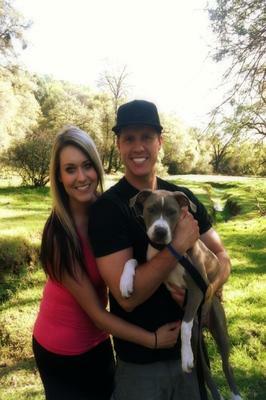 Our little family went hiking to a waterfall. That's the day he proposed! 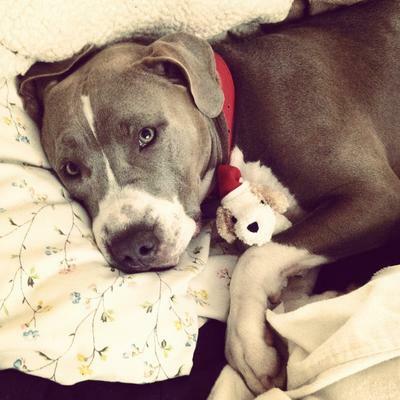 Kiya (pronounced k-Y-A or K-Y-A-H) is a purebred blue nosed pitbull princess! I chose her name because it means "diamonds in the sky" and I wanted something to go along with her being a blue nose. She is 11 months old. She is the most loving dog in the whole world and my fiancé and I just adore her! We got her when she only 4 weeks old and bottle fed her throughout the night every 2 hours! You can see just how attached she is to us as we are to her. I think that explains why she nurses on a blanket every time she falls asleep. It's so adorable. She always has to sleep on the bed with us even though she has two giant ones of her own! :) And she has to have her head on our pillow and under the covers. She is a total diva. She loves to play outside and do tricks she learned from her puppy school. She is very smart and working on being more obedient but is still a puppy. She has had two surgeries on her left back leg and the metal pins are finally out and the bone is healed. She still has scars from her gashes and burns but she is still the most gorgeous dog I know. After all that trauma she is still the most loving happy dog there is! You wouldn't even know she was ever ran over cause she has the most amazing joyful personality! Whenever I'm sad or angry I can't help but smile when I see her. She always has a great big crazy welcoming when I get home and will give me tons of kisses. 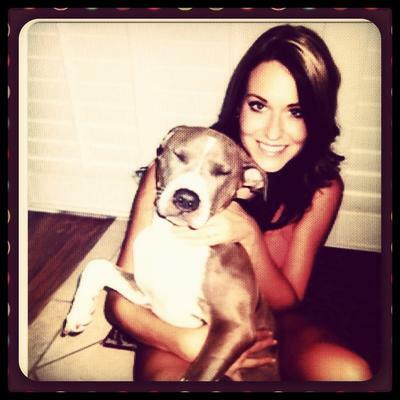 I love Kiya like she is my baby and I will protect and always care, and spoil her forever. This is a long shot but by chance is your dog missing? Friends found a dog today that looks like your dog, though much less healthy unfortunately. Microchip says her name is Kiya but no owner info. Please respond either way.